My family came across this photo of my grandfather at the wheel of this car, which looks to be bearing a Rolls Royce spirit of ecstasy radiator cap. 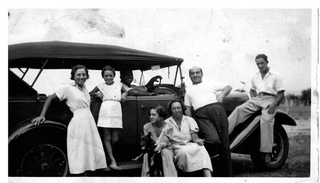 The photo would be from the late 1930s, but the car looks to be a decade or so older. Pop-pop and great grandpa were both sort of celebrities in Australia at the time (Pop-pop was a pro wrestler and his father was a well-known opera singer), but I don't think either of them had it like that. Can anyone confirm the make and ID the model and year? Many thanks in advance. Anyone know what this is? Spotted in Marfa, TX.